Monopoly was delisted from Xbox Live Games on Demand between November 2nd and December 1st, 2010. Electronic Arts held the Hasbro license from 2007 to 2014 and released several games based on their board games on numerous platforms. Ubisoft announced in August of 2014 that it was the new license holder for Hasbro properties resulting in the delisting of this and most other EA published titles. 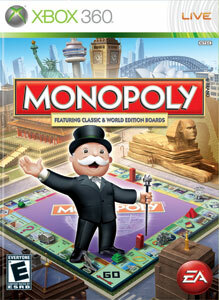 “MONOPOLY returns in 2008 with a new way to play the classic Hasbro board game. With a host of current-day cities and landmarks from all over the world, this new version will let players wheel and deal and compete to own some of the most recognized locations on Earth. In this all-new, super-fast version, trade properties and compete in exciting mini-games to see who makes the top of the rich list! Up to four players can simultaneously join in on the “rags to riches” fun (multi-tap support for PS2). The most extensive collection of MONOPOLY boards all in one package – from the newest MONOPOLY HERE & NOW: The World Edition to classic MONOPOLY. • Fill up your passport as you play to unlock new and never-before-seen MONOPOLY boards.